I’m looking forward to speaking about my work in Treece at the SPE Northeast Chapter Conference this October. The conference, with the theme “Tipping Points,” will be held at SUNY New Paltz from October 6-7, 2018. I’ll be speaking about my work at 12pm on Sunday, October 7th. I hope you can join me! The world is facing unprecedented change on multiple fronts -- environmental, technological, sociological, psychological, and political. While historically things are always in flux, the exponential acceleration of so many factors is new to our age, as is the concept of humans propelling irreversible tipping points at a global scale. The world is facing unprecedented change on multiple fronts – environmental, technological, sociological, psychological and political. While historically things are always in flux, the exponential acceleration of so many factors is new to our age, as is the concept of humans propelling irreversible tipping points at a global scale. The 2018 SPE-NE Chapter Conference addresses the ways in which artists are responding to this rapid acceleration at global, local, and internal levels through photography and related media, and how the photographic medium itself might be implicated in these changes. I'm happy to have a few pieces from my Treece series on view at Tipping Points, and exhibition at the Palmer Gallery at Vassar College. Tipping Points will be on view from Thursday, October 4 - October 25, 2018, with a reception during the SPE Northeast Conference on Saturday October 6 from 6-8 pm. I make work that examines how the camera contributes to our understanding of community and identity. I began to think about the relationship between food and identity while working on my series of photographs in Treece, Kansas. I stumbled across an old church community cookbook (a cookbook filled with recipes contributed by those affiliated with the church, likely created as a fundraising tool) and decided to make one of the recipes. It was for a scripture cake, and making it requires going on a sort of treasure hunt in the Bible. It seemed to represent the community of Treece in a lovely way. I baked the cake and photographed it, all the while thinking of the many people before who had enjoyed making this cake as well. Shortly after baking the cake, I began creating a new body of work inspired by community cookbooks. This work is still in progress. I began this new project while at a residency in Ithaca, NY, which took place during the time I spent as an A.I.R. Gallery Fellow from 2013-2014. It seemed fortuitous that the gallery asked each of the fellows to create some sort of community project. Thinking about how food we make and share together as families, friends and as a community plays a large role in our identities, I decided to make a community cookbook for the gallery. The result is the A.I.R. Gallery Community Cookbook, a collection of recipes that were contributed by members, staff, fellows and other female artists affiliated with the Brooklyn-based gallery. The book includes recipes and tips, along with photographs exploring the identities of the artists who shared them. I photographed the artists in their studios, examining the links between creativity in the kitchen and in their art practice. This diverse collection of recipes could only come from this community. Cooking from this cookbook will allow readers to gain insight into various aspects of the A.I.R. Gallery artists’ lives. The women who make up this community are just as diverse as these recipes: they are artists, bakers, cooks, theorists, wives, mothers, daughters, teachers, feminists, designers, writers, poets and much, much more. The A.I.R. Gallery Community Cookbook is softcover, 8.5˝ x 11˝, with 152 pages, 82 recipes and 80 color photographs. The cookbook is available for purchase through Blurb for $40 by clicking on this link. In true community cookbook style, a portion of the sales will be donated directly back to A.I.R. Gallery’s Fellowship program. Click here to read an interview I did with Les Femmes Folles about the cookbook. I'm happy to have work in WE:AMEricans on view at Station Independent Projects on the Lower East Side. The exhibition runs from 7/7/16-8/13/16, with an opening reception on July 7th from 6-9pm. UPDATE: There's a lovely review of the exhibition on American Photo. Click here to read it. I'm looking forward to having a discussion with Natasha Chuk as part of SVA's Art in the First Person series. We will be talking about Natasha's new book, Vanishing Points: Articulations of Death, Fragmentation, and the Unexperienced Experience of Created Objects. Chapter 6 is called "Traces of Absence in Photography: Dina Kantor and Alec Soth," where she writes about my work in Treece. Please join us at SVA next Monday evening. I enjoyed being interviewed by Melia Robinson, a reporter at Tech Insider (the newish, future-focused sister site of Business Insider) about my work in Treece. The story went up today. Click here to read the full article. I'm incredibly honored to have had Natasha Chuk write about my series Treece in her new book, Vanishing Points: Articulations of Death, Fragmentation, and the Unexperienced Experience of Created Objects. 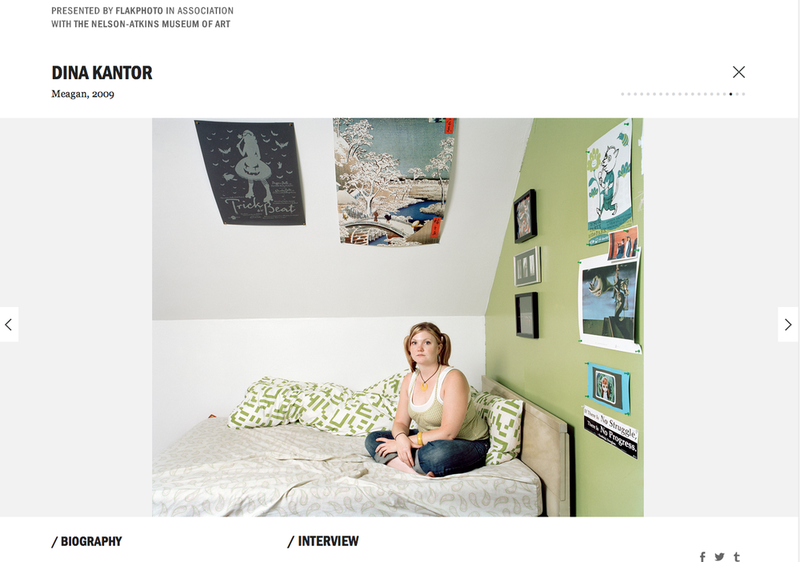 Chapter 6 is called "Traces of Absence in Photography: Dina Kantor and Alec Soth," where she talks about my work in Treece, as well as Alec Soth's work. It's very exciting! I'm so honored to have been able to attend LMCC and Creative Capital's ASI workshop on Governor's Island for the past 5 days. It has been an amazing learning experience, and I've loved getting to meet 54 other artists and learning about their work. I'm very pleased to have participated in a discussion about place with Andrew Moore, Charles Traub, Maureen Drennan and Matt Hermann. You can read it in the recent issue of All the best, Alice. I'm happy to have work included in If These Walls... an exhibition at 5B Nolan Park on Governor's Island. An exhibition of my photographs from Treece is on view at A.I.R. Gallery June 26- July 20, 2014. There will be an opening reception on Thursday June 26 with an artist talk at 6:30pm. A.I.R. Gallery is located at 111 Front Street #228, Brooklyn, NY. Kurt Shaw of the Tribune Review writes about Finnish & Jewish at the American Jewish Museum in Pittsburgh. 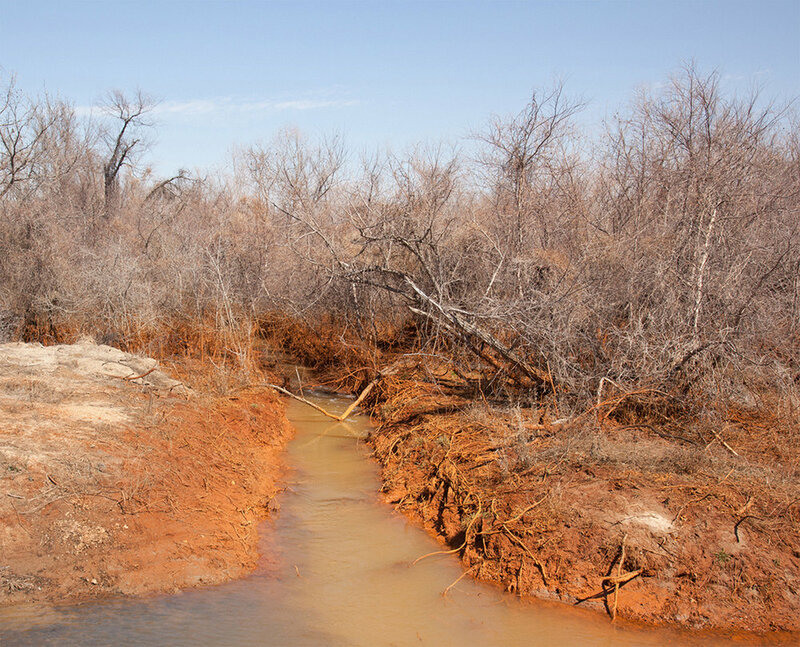 Click here to read "Photographs Examine Ties of Place and Identity." I'm happy to have four photographs in the Art Faculty Exhibition at Adelphi University this year. The opening reception is on November 6th, and the exhibition remains on view through November 24, 2013. Please stop by the gallery to see this great show! 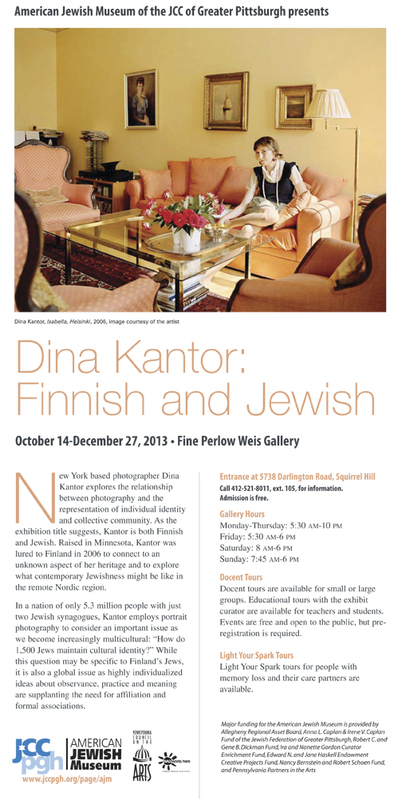 Finnish & Jewish is on view at the American Jewish Museum in Pittsburgh, PA through December 27, 2013. Very excited to have An Xiao highlight my photographs in an article on Hyperallergic about the Making Pictures of People exhibition at the Nelson-Atkins Museum of Art in Kansas City. The piece, New Exhibit Probes Changes in Portrait Photography, can be read by clicking here. If you are near Ithaca, NY, please join me for an open house at the Saltonstall Foundation for the Arts this Sunday, September 22, at the colony. I'll be sharing some of what I have been working on this month. You'll also see and hear some work by the other four residents. Refreshments will be served at 2:00 pm, with a reading and open studio time to follow at 2:30 pm and 3:15 pm, respectively. I am excited to have my photographs on view at the Pascal Gallery at Ramapo College. Photography Sampler, Ramapo is an exhibition of four photographers: Eva Fazzari, José Hernandez, Dina Kantor and Tema Stauffer. The show is on view from September 18 - October 18, 2013. There is an opening reception on Wednesday, September 18th from 5-7pm. I'm honored to be included in Making Pictures of People, an exhibition curated by Andy Adams from Flak Photo. The exhibition is on view at The Nelson-Atkins Museum in Kansas City, MO from August 9, 2013 - January 14, 2014 in conjunction with About Face: Contemporary Portraiture. Visitors to the museum can view Making Pictures of People on touchscreens in the gallery, or online. There is a lovely piece about my photographs in Treece on Feature Shoot. Please click here to view the story.